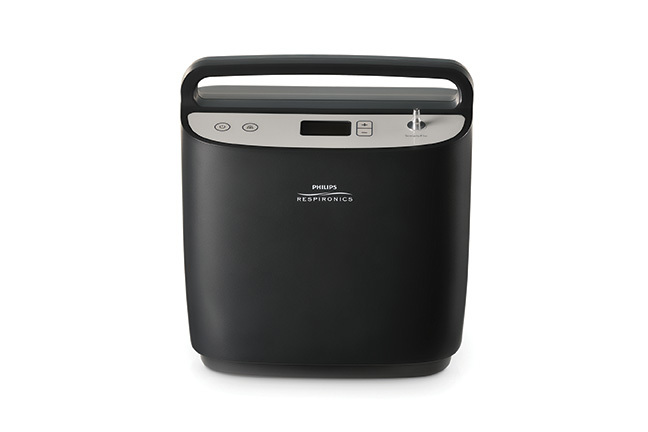 Philips Respironics has a new stationary oxygen concentrator out called the SimplyFlo. This new unit is very similar to the SimplyGo Portable Oxygen Concentrator, however it only operates on AC wall power electricity. This machine does NOT have a battery power option. It is designed for people who only need oxygen to sleep with at night. The SimplyFlo Oxygen Concentrator is perfect for people who travel with a CPAP machine and need therapeutic oxygen. Traveling with multiple pieces of medical equipment can be a chore. 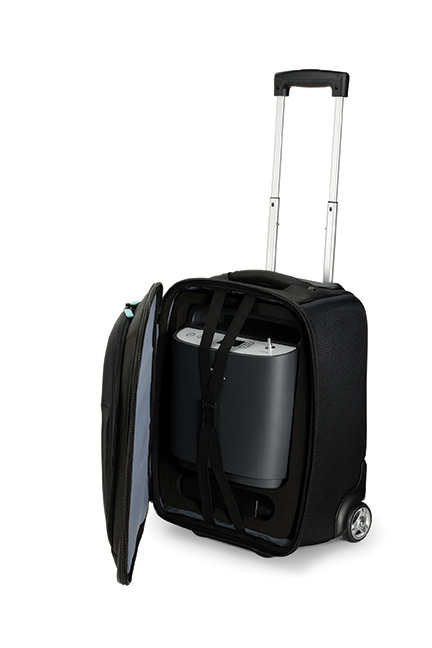 The SimplyFlo weighs 8.5 lbs and will fit underneath the seat in front of you on an airplane, or in the overhead bin. It is not a great idea to check this equipment as luggage. Because this is medical equipment, most airlines should not charge anything extra to bring it on board. However, it is up to each airline what their rules are regarding medical equipment that is not being used on the aircraft. It is a good idea to have a letter from your doctor explaining oxygen is only needed at night at the destination, and not needed for in flight use. The SimplyFlo uses the same “shell” or hard plastic case as the SimplyGo Portable Oxygen Concentrator. 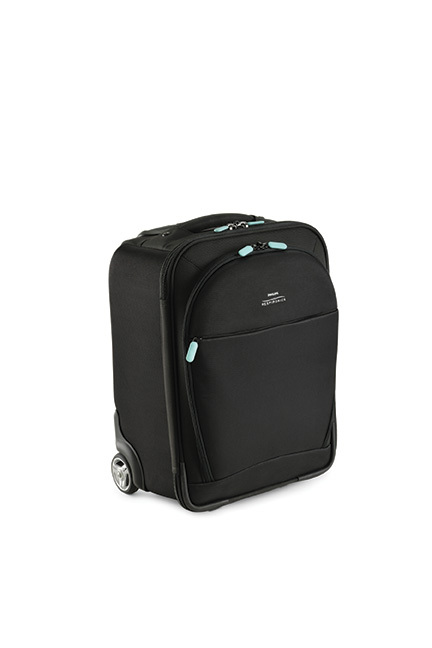 It is a smokey matte black color with a very easy to grab handle on top. The SimplyFlo Oxygen Concentrator is easy to operate with simple buttons and an easy to read display. Changing the flow rate is not difficult, it offers setting from .5 to 2 LPM continuous flow. 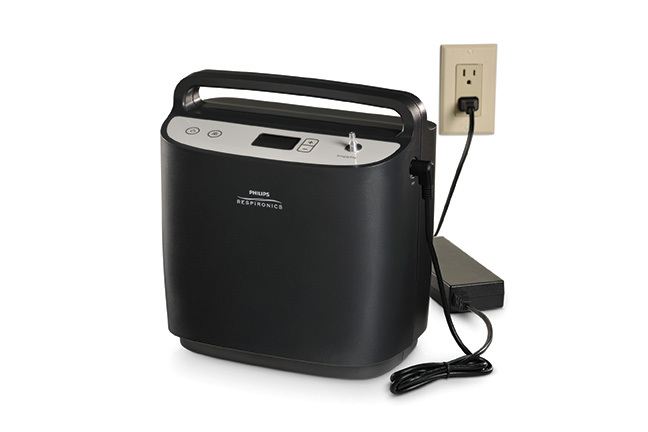 Noise is a much less of a concern with this oxygen concentrator compared to other full size models. While it still makes some noise, the SimplyFlo is very tolerable for light sleepers. Many people who routinely sleep with oxygen may choose not to deal with setting up local oxygen equipment at their destination when traveling. For these people, a good nights sleep may become secondary. A bad nights sleep results in an unpleasant next day. The SimplyFlo Oxygen Concentrator is a great solution to traveling with oxygen only needed at night. It ensures a pleasant nights sleep to be ready for the next day of events. Advanced Aeromedical offers short term rentals and sales of the SimplyFlo Oxygen Concentrator. Call us at 800-346-3556 to find out more.